Our Blade Jacket is a short down jacket with a metallic and semi-opaque look. Characterized by a feminine and slightly screwed fit, thanks to the slits on the sides, this padded jacket offers a modern and contemporary look. The outer fabric is in a precious and unique Nylon, while the inner lining is in a slightly more satin Nylon and colored in contrast. The direct injection padding in 100% real down, of which 90% white duck down and 10% feather, makes the garment extremely soft and pleasant to wear. The feather offers maximum lightness, while ensuring the highest performance of heat retention and wind coverage, ideal to never get surprised by the autumn rains or winter temperatures. This down jacket is built with a horizontal quilting and is equipped with all the details necessary to face at the best the Autumn Winter 2018 season. The hood is windproof and water resistant, as well as detachable through hidden buttons. The front pockets are concealed with zip and mini-slider. The front closure with zip in tone and double slider. Windproof cuffs to guarantee maximum protection from atmospheric events. Wear it for a walk in town with friends, or for an autumn evening with friends. Ideal for an urban look over jeans, but also for more formal occasions. Buy it today in 4 intriguing colors. This women's winter down jacket offers a captivating and modern look. Thanks to its minimalistic composition and in-depth research of the details, it guarantees an unmistakable and impeccable style. 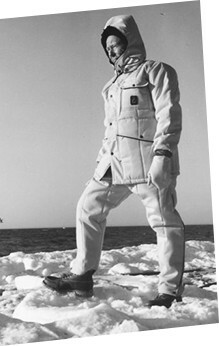 Our Blade Jacket is an extremely comfortable and practical garment; the padding is made of 100% real down, of which 90% white duck down and 10% feather, and will protect you day by day from any weather you may encounter; the hood is removable with hidden buttons, and therefore can also be used for more formal occasions with a medium-high neck and a classic look; the quilt is horizontal but enlivened by the various splits that offer a greater vivacity and a perfect rendering on the body shapes. The outer fabric is in a precious and unique Nylon, while the inner lining is in a slightly more satin Nylon and is colored in contrast. The front pockets are concealed with zip and mini-slider. The front closure with zip in tone and double slider. Windproof cuffs to guarantee maximum protection from atmospheric events. Wear it for a walk in town with friends, or for an autumn evening with friends. Ideal for an urban look over jeans, but also for more formal occasions. The sizes range from an X-Small to a Large. Buy it today on our official website in 4 simple but intriguing colors: Silver, Light Blue, Dark Blue and Black. All RefrigiWear items must be treated with care; correct treatment will guarantee the maintenance of performance and appearance over time. It is recommended to wash by hand or dry-clean. No bleaching and no tumbler drying. Recommended drying out laid. Use a warm iron at 110 degrees if necessary.